Treat the underlying cause, if possible; otherwise a surgical shunt is created to decompress the ventricles. 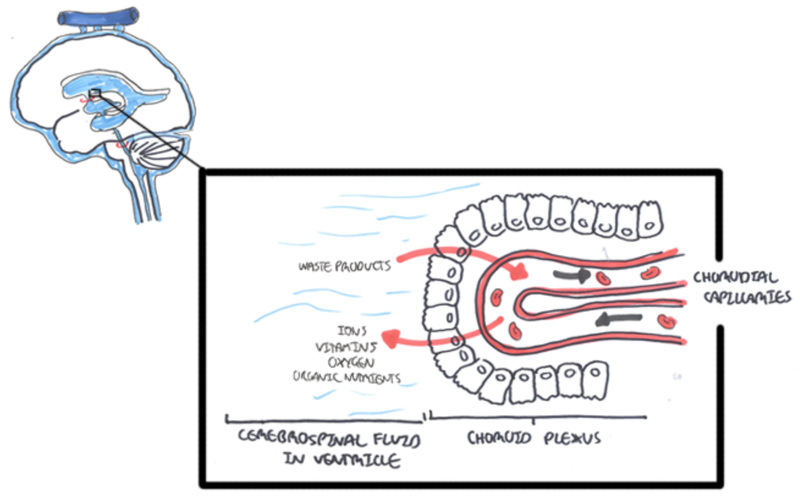 CSF is produced primarily by the choroid plexus, which is responsible for 60 to 80 percent of CSF production. 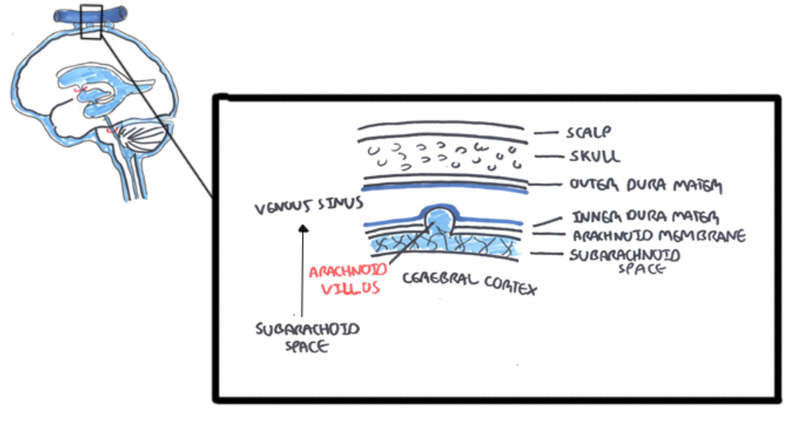 The choroid plexus tissue is located in each cerebral ventricle and consists of villous folds lined by epithelium with a central core of highly vascularized connective tissue. CSF supplies brain tissue with nutrients and flows through the ventricles before being absorbed back into circulation from the venous sinus. CSF production rates are constant in physiological conditions unless extremely high levels of intracranial pressure are reached. Thus, absorption of CSF generally matches the rate of production to accommodate the volume of CSF being formed each day. CSF returns to circulation via the venous sinus. Side note Hydrocephalus ex vacuo describes increases in CSF volume without increased CSF pressure, which is seen in conditions of reduced cerebral tissue (i.e malformation, atrophy). 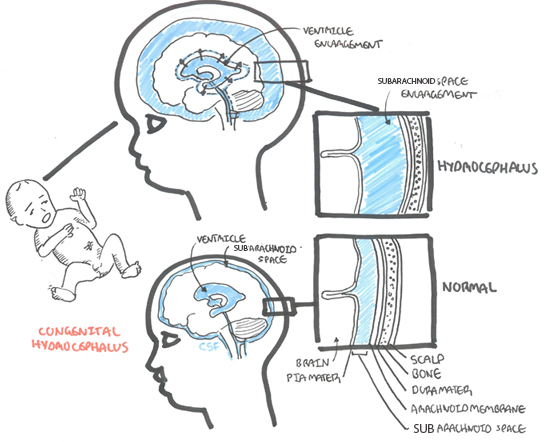 Hydrocephalus should be suspected in an infant whose head circumference is enlarged at birth or in whom serial measurements cross percentiles in standard growth curves, indicating excessive head growth. 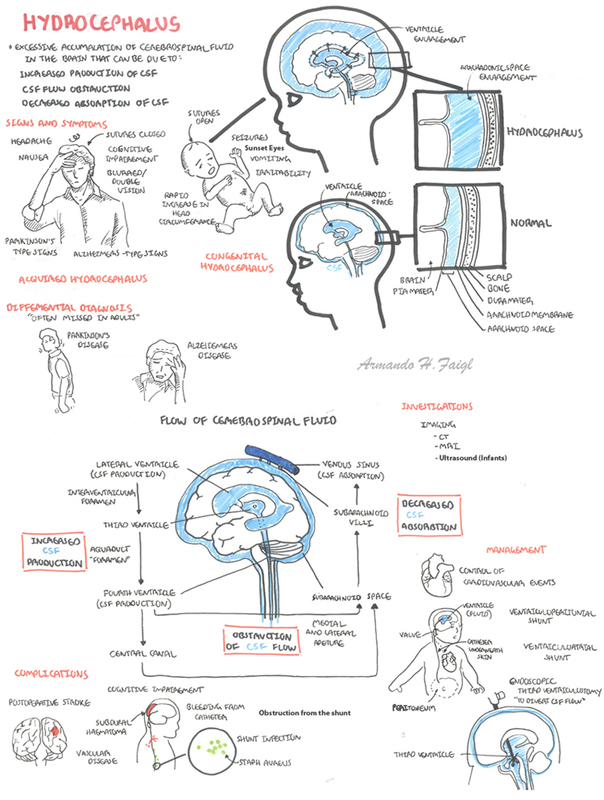 Hydrocephalus should be considered in children with severe headache and other features suggesting increased intracranial pressure (ICP). In a newborn, ultrasonography is the preferred technique for the initial examination because it is portable and avoids ionizing radiation. As the anterior fontanelle closes, the ultrasound is no longer a useful diagnostic modality. In older infants and children with suspected hydrocephalus, CT or MRI should be performed. 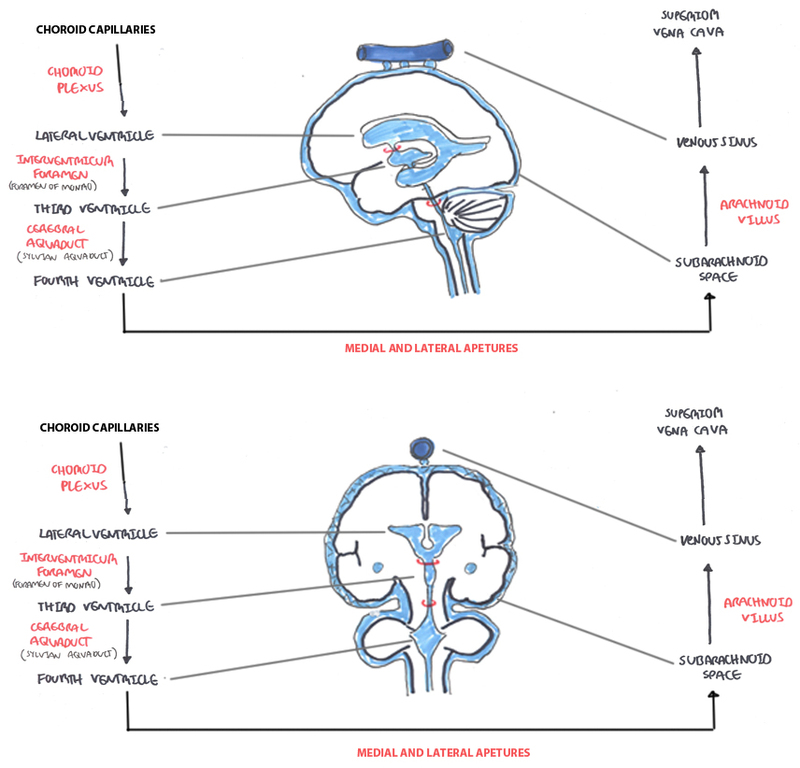 These imaging studies will also detect associated central nervous system (CNS) malformations or tumors.Brain imaging can help to distinguish obstructive (non-communicating) from absorptive (communicating) hydrocephalus. The diagnosis of hydrocephalus is confirmed by neuroimaging.